Brick pillar with steps is probably for a sunshine recorder. 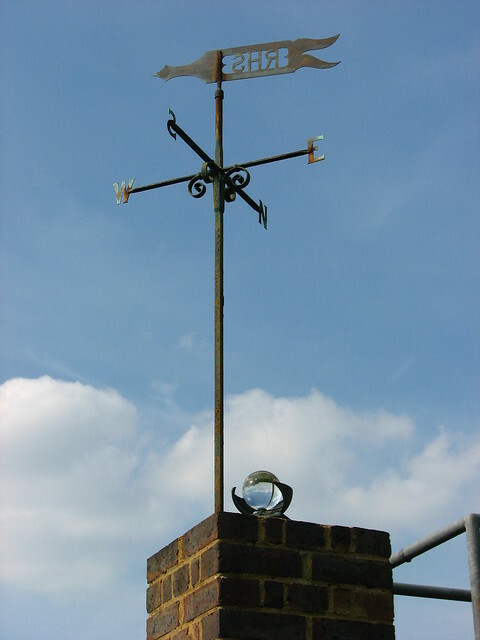 A Wisley site has weather records from 1904. 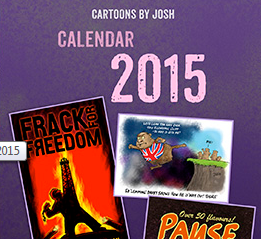 Obviously there have been major site changes. This is probably a good example of a man-made micro-climate. Main question about Class 3 or 4 is I think whether there are >5% objectionable items in the annulus between 5 metres and 10 metres. 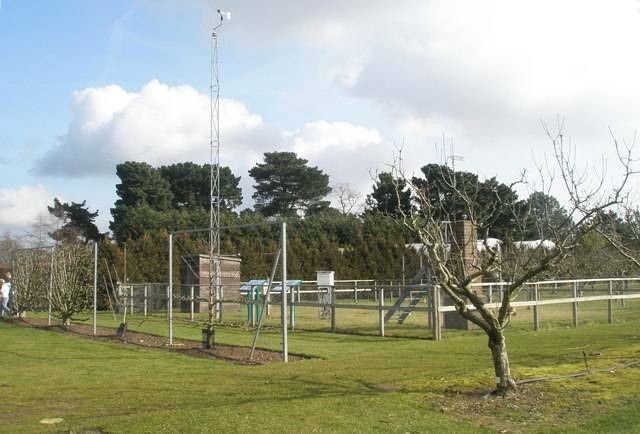 I rather doubt the WMO guidelines had these kinds of problems in mind, such as cordon trained fruit trees or fences. 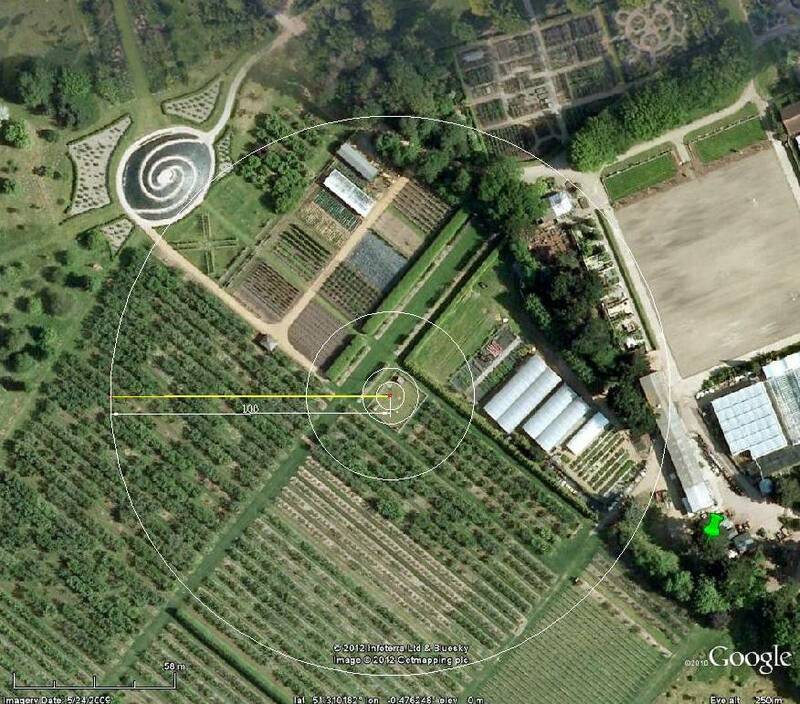 On a wider scale the polytunnels are encroaching, see Google time-line. Essentially this site has poor exposure; radiately (shouldn’t need a raised sunshine recorder) and for wind. “Quite often when we do have heatwaves, Wisley for some reason does become one of the hottest areas,” Tomkins said. The nearest reasonable site but still surrounded by aerodrome runways is South Farnborough. Several more not far away but unfortunately Wisley is not part of the immediate data network so on. Only the Met Office could provide the detail data. When I looked at the available metadata there is no record of a thermometer check. Gravesend-broadness for example has such an entry. * An explanation might be disruption of VHF radio propagation. 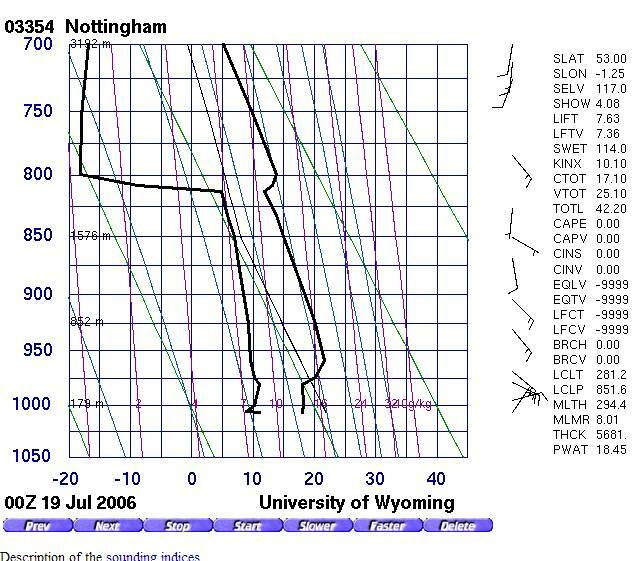 There seems to have been a spectacular event mid July 2006 and as usual this is weather related. [I might have jumped too far for many readers: weather information is broadcast by radio; some radio wave propagation is affected by atmospheric and ionospheric electrical conditions; this is related to weather and sometimes solar conditions, as well as day/night and season. Camborne shows it similarly the day before. Looks to me like several days of building heat which is about to collapse, as it did. Disruptions to communications critical to air safety in the day and age is a matter of concern. Never mind, fuel here for anyone wanting a weather event candidate for close examination. Another geograph photo from later in the year here.Note the visitor information signs just inside the fence. A couple of photos of the sunshine recorder (attrbute reproduction) Is it still used or has an automatic sensor (see picture above) been fitted and it has been left to remain as it is quaint? Presumably it is, manual is entirely possible. Marked as non-standard AWS, has some stuff on monthly forms (I think). No mention of automatic rad values. The flickr image uses the word “was”, pic shows no paper in there so a question is begged.